Request A Visit To Have Your Liner Problem Diagnosed Today! When you turn to Aqua-Tech to assess and diagnose the issues causing wrinkles in your liner, you'll learn what's causing the unsightly issue, whether your liner is leaking, and more! 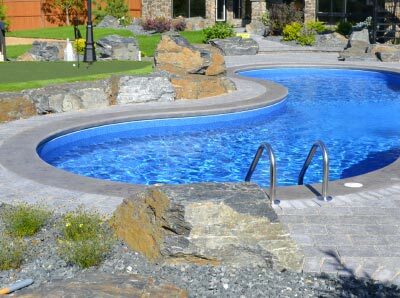 Your pool liner can have a considerable impact on how much time you spend enjoying your pool. If there are elements that aren’t aesthetically pleasing, such as a wrinkly floor, crooked walls or an uneven, worn surface, it can mean that your investment won’t be enjoyed as it should–particularly once that underwater light is switched on. When you turn to Aqua-Tech to replace your pool liner and assess your pool structure, you are guaranteeing that your swimming pool will finally become an asset you can be proud of. Our liner replacement process is straightforward and highly effective. We use a systematic approach to assess the cause of the problem, then determine the appropriate course of action to seamlessly install a new liner and prevent a reoccurrence of the issue. Next, we evaluate the requirements for replacing any other components. Once we have a full picture of the situation, we’ll then recommend the best way to proceed. Aqua-Tech has four teams dedicated to pool liner replacements, ensuring that when you work with us you’ll enjoy an experience as simple and seamless as your new liner. You’ll also be pleased to know that we can replace your new liner faster than anyone else in Winnipeg, on average taking just 7 days. Throughout this period, the work will be overseen by with our in-house project manager. We do all of the work by hand, so space constraints are never a deterrent to an impressive final product. For more minor liner wrinkles, you can rely on Aqua-Tech. We’re the sole swimming pool provider in Winnipeg to offer a liner de-wrinkling service for unsightly creasing or folds in your liner. Our innovative, exclusive equipment can quickly smooth out your liner, helping extend its lifespan and return it to a much more attractive state. Don’t let your liner problems grow until you can’t use your pool. Call today to find out how we can help you enjoy your investment again.